I was three when my parents decided that I should go to school, as I needed too much attention at home because I was never quiet. So I spent three years at a nursery school until I was old enough to start my primary school years. Those three years would mark my life as being a little girl; I was not ready to cope with the fun that peers would make of me because of my weight. I must have been five when my mind started experiencing emotional and psychological conflicts that strongly influenced my behaviour throughout the years that followed. At that early age I did not know what the ego of pride was, but I had a clear sense of pride. At around the age of five, I started to hate myself, feel inferior to my peers, and feel uncomfortable in group environments. I was never satisfied with my accomplishments, and felt bad if I did not succeed. I always looked at myself in a negative light and felt more comfortable when in solitude. I was born in a Catholic family and attended a Catholic school. At school, although my mind was overwhelmed with negative thoughts about myself, I learned with enthusiasm the principles of my religion and felt very inclined to follow them in my life. I wanted to become a good person and feared committing any mistake because I feared God. At school we would be told that not going to mass on Sundays was a mortal sin, so I started going to mass in order not to be punished by God. But, little by little, as I was doing some spiritual practice under my religion, a genuine desire for finding God developed within me. In some way, the solitude I felt because of my emotional difficulties helped me to get closer to Him. I used to read the Bible, go to church, and actively participate in activities that the school carried out to serve others. I liked to attend youth spiritual meetings, and became more and more engaged in spiritual activities, from reflections about the Bible to spiritual retreats. During secondary school, I obtained some leadership roles in these activities and also used to be asked to comment on sermons during mass. All of this, together with my efforts to succeed as a student, made me feel that I had become the good person that I wanted to be. However, my thoughts and emotions continued to be the same. I was always sad, I would barely speak to my family at the table during lunch, and many times I used to cry alone in my room. My parents were an example of love and respect, but I was never able to talk to them about my emotional difficulties. My mother suffered from profound depression since I was a child, and most of the time she was crying. I used to be by my mother’s side after she had received torturous shock therapy, and that added to my emotional suffering. One day I found myself crying in despair for her in the classroom as I was realizing that no medical treatment was being successful in relieving her from her illness and psychological pain. At this time of my youth, I wondered why all of this was happening to me. Thoughts like, “Why was I born to suffer,” “Why am I not accepted by others,” “I wish I would just die”, used to arise in my mind. Later I would learn that all of these thoughts were due to my deep rooted ego and were exacerbated by the influence of negative energies to prevent me from finding God. A few years before graduating from school one of the nuns encouraged me to join the religious life, and for some time I considered the idea of becoming a nun, but my destiny was to be different, as I wanted to one day get married and have children. After school, a different period of my life started in which I forgot completely about my inner desire to realize God. I became an artist after my university studies, and a few years later I started a career in the cultural field at an international organization. I got married four months after I met my husband, and formed a family with our three children. So, in some way I was happy that I had achieved some goals in life. But my mind continued to be troubled and did not feel well emotionally as all the feelings that I had had during my childhood about myself, had remained unchanged. Also, in spite of the difficulties that I was experiencing in my marriage I never once remembered that I had so much yearning for God at one time. Somehow, I never turned to God during these years. But, God had a plan for me, and later I realized why early in my life I had chosen to be a married woman and have children. One of my sons at the age of 16 became very ill. His condition reminded me of my mother’s suffering and my emotional trouble increased. We visited a number of doctors who treated my son with different medications that were not helping him, and after 5 years of unsuccessful treatments I became hopeless. By that time, my marriage ended in divorce and I moved with my children to another house. As I continued to visit doctors in an attempt to find a way to give my son some relief, I started noticing a change in him. In 2007, when he was 22, he would spend hours on the computer reading information, and also talking over Skype, but my son would share very little about this with me. One day I was concerned when accidentally I glanced at his computer screen and read something about ghosts and demons. Since I wanted to know what my son was reading, I looked for the website, and started going through the articles. This is how I found the Spiritual Science Research Foundation. Later, I would realize that the main aim behind my son reading the SSRF website and interacting with other seekers was to find a spiritual remedy for his illness. This became very clear when he travelled to the SSRF Center in India by his own means. In 2009, two years after my son became a seeker of SSRF, I was visiting my daughter while she was studying abroad. 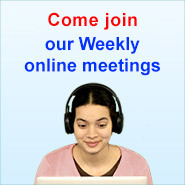 One night, she told me that she would connect with her brother over Skype to participate in an online satsang (company of the Truth). This was new to me. Later I came to know that my daughter was also a seeker, and that both my son and she had been participating in satsangs together, while I was more focused on my worldly activities. Since my daughter and I were sharing the same room at her flat, that night I was able to listen to a satsang for the first time. That moment, I was silent, listening to what seekers were sharing, and also observing my daughter when she was praying during satsang. For some reason, I felt very calm. Now I know that it was the Divine consciousness that one can feel during satsangs that had made the environment so peaceful. In 2010, my son motivated me to start doing some service to the Absolute Truth (satsēvā) of translating articles of SSRF from English into Spanish, which I did. Few months later, just after Gurupourṇimā day (the day when the Teaching Principle of God is 1000 times higher than on other days), I started my spiritual journey by doing the chant of “Shrī Gurudev Datta,” and felt like God was calling me again after so many years. 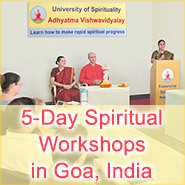 In 2011, I had the privilege to attend a Spiritual Workshop held at the SSRF Spiritual Research Centre in Goa, India. My time there could have not been more blissful, as I learned from other seekers´ experiences and efforts while on their spiritual path. By looking back at my early years when I was engaged in spiritual activities at school, I realized that God had always been within me, despite the many years that I had forgotten about Him. This time, it was the right time to start spiritual practice as per the 6 basic principles of spiritual practice. Soon after I started spiritual practice. I started reading the spiritual experiences that other seekers were obtaining due to their spiritual emotion (bhāv). I was very motivated and wanted to experience the same as I had never experienced the spiritual dimension. But I noticed that I was not having any spiritual experiences like other seekers and I began feeling frustrated. After some time, I came to realize that spiritual experiences come as per God´s wish, and that instead of having so many expectations to obtain one, I should focus on putting in efforts in my spiritual practice. I continued to make efforts, and little by little God started to tell me that I was going in the right direction by giving me many spiritual experiences that motivated me immensely. I had my first spiritual experience one day after I had taken my youngest son to a mountain close by. As I was driving back to participate in a local satsang, I was going fast, praying that I make it to the satsang on time. All of a sudden, I started smelling the fragrance of jasmine inside the car. I looked for any source for that fragrance and could not find any. The fragrance lasted for about 30 seconds and I was in Bliss (Ānand). Then I drove calmly and arrived at the satsang very much on time. God has also given me the spiritual experiences of receiving Divine particles on my hands, and of hearing Divine sounds while doing satseva. I am most grateful to Him for encouraging me to continue to walk my spiritual path with enthusiasm, by giving me these spiritual experiences. The process of removal of personality defects and ego that I started as part of my spiritual practice has been a gift from God Himself. It has helped me to understand that my mind brings impressions from past births that impact my day to day life. My ego of pride since my childhood must have been present in my mind for many past lives, and it is very deep rooted, but under the guidance of SSRF I have found a way to start its dissolution. Throughout my life until I joined SSRF, I had been angry at myself, and also angry at whoever would make me realize my failures. Since I hated myself and had the thought that I was of no value, I could not accept it if others reminded me about it, and got very angry. Also, I could not accept that I was committing any mistakes and would feel bad for several days after, as what I wanted was to be seen as perfect. I had always presented myself to others as a self-confident person, when inside I was feeling the opposite. These manifestations also arose when I started implementing the personality defect and ego removal process, as I would not accept when other seekers told me my mistakes. On one occasion, a seeker asked me how my pride was going and I got very angry with him. Through spiritual practice under the guidance of SSRF, I have learned how to accept my mistakes, and how to make efforts to avoid committing them. Also, I have understood that if I make mistakes then they are there for my learning. People have always known me as being a quiet person, but I think that this quietness may have not been genuine, as I was trying to hide my conflicts and insecurity. Today, after starting spiritual practice, I feel that I am genuinely becoming a quiet person. The anger at myself has reduced, and also the thoughts of the past about my life not being valuable to me. A big learning is that there is no more valuable gift than life on Earth as God gives it to us to do spiritual practice to reach Him. Many times I have thought that if my mother had done spiritual practice she could have received protection from the impact of negative energies, and could have had a better life by finding relief to her profound depression. In my case, negative energies affected me by magnifying my ego and by creating so many difficult and emotionally painful situations in my life. I am most grateful to God that I am being able to reduce my ego and also develop a more positive state of mind under the guidance of SSRF. The day when I chose to have children, I did not know that destiny was playing its part. I returned to God because of them. We help each other in our spiritual practice as we are family, but most of all because we are co-seekers. This has been one of the most blissful spiritual experiences that God has given me. My faith in God increases every day, and I feel His presence in all actions and situations of my daily life. Today, I do not hate but love myself, because my inner soul is God, and I love God immensely. I surrender unto His Holy Feet. – Mrs. Silvia Dáttoli, La Paz, Bolivia – South America.